What is your super power in the kitchen? But this ability to envision the eventual dish fails me when it comes to cuisines that I am less comfortable cooking. Indian food falls into this category, which is why I appreciate starting with a good recipe that will rely less on my intuition and more on my ability to follow directions. So mostly I stick to recipes from Vij’s At Home. But dazzled by the success of that saag paneer I keep making (thank you, Kolpona Cuisine! 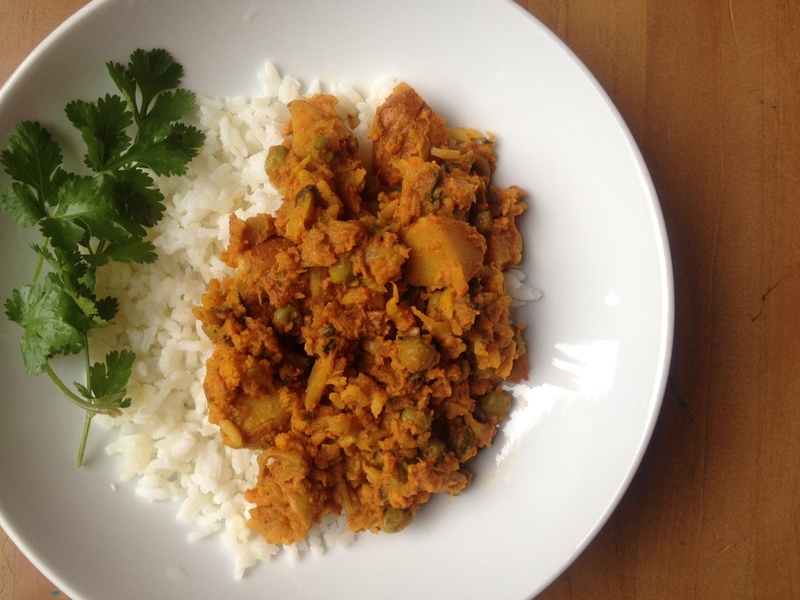 ), I decided to branch out to this aloo gobi recipe from the gorgeous vegan blog v:gourmet. I followed the recipe exactly, except for the splash of cream I added at the end. What can I say? My super power told me to. This dish plus the saag paneer and rice make a respectable Indian-themed feast for company. And whether or not you’re making multiple dishes, consider making this one a day ahead. The flavor was even better the following day. Aloo Gobi: Saute a chopped onion in olive oil over medium-high heat until softened. Add 1 tsp. whole cumin seeds and cook until they sizzle and pop. Add 1 Tbsp. each peeled and grated ginger and garlic, stirring until fragrant, then add 2 tsp. each ground turmeric and garam masala and 1/4 tsp. cayenne, stirring for one more minute. Add 16 oz. crushed tomatoes, 1 tsp. salt, 1 large cauliflower broken into small florets, and 3 large diced waxy potatoes. Cover and cook, stirring often, until potatoes and cauliflower are tender, adding a little water if necessary to keep everything from sticking. When everything is tender, remove from heat and stir in 1 c. peas, re-covering the pot for a minute to warm the peas. Stir in one small chopped bunch of cilantro, then season to taste with salt, pepper, and (optional) cream. This entry was posted in Asian Flavors, Food, Recipes, Vegan or Would-Be-Just-As-Good-Vegan and tagged cooking, dinner, DIY, family, food, homemade, lifestyle, recipes, vegan, vegetarian on June 4, 2012 by emmycooks. Looks wonderful, Emmy! Good idea to add a splash of cream. Cream and potatoes goes so well together. My kitchen superpower? I can save mayonnaise. When it breaks, I can bring it back to life. It doesn’t really break very often though . . . but when it does, whoa golly am I good! I actually thought about blogging about a kitchen failure the other day. My culinary weakness is Chinese food. Seriously. I have a 40% failure rate making rice in a rice cooker. And I can count the number of times that I have stir-fried on one hand. With fingers leftover. My mom is ashamed. I actually stir-fried for the fourth time ever today and it was a disaster. I called my mom right before I did it too. I asked her how to stir-fry and there was just silence on the other end of the line. But I still ate my disaster. Felt sick afterwards, but I felt obligated to eat my mistake! I also excel at béchamel. p.s. Stir-frying is not my forte either. Let’s hope that someone chimes in that stir frying is THEIR super power, and then we can learn from them together! That would be fun to rescue home cooks around the city! However, as a New Yorker, part of the Youtube clip would be me asking if what the rent was, if the unit was rent-stabilized, and if they had to pay a broker’s fee. You would then probably have to watch me flush the toilet and open a tap (check for water pressure) before asking if they could put me in touch with their landlord just in case their neighbor upstairs moves to a assisted living community. Then I would rescue the mayonnaise! I hope stir-fry is someone’s super-power! I just can’t figure out the order that the stuff goes in the pan. I also can’t wrap my head around not letting my food develop a nice crust. And I keep wanting to deglaze with wine and finish it in the oven. Y’all are funny. Maybe Daisy and I are like the folks in those movies where people switch brains. I, the Southerner, lack the patience to develop the nice crusts (too impatient! I’m always turning too much! Even on things like fried chicken!) and yet I can stir-fry like I imagine the best Chinese housewife does. I think we must have switched brains. I bet you would make an amazing Chinese housewife! I would make an amazing pampered and overweight Chinese son. Really. I would be excellent! You guys are hilarious. Ok, maybe we can set up a Skype chat or something where Michelle teaches us how to stir-fry, Daisy teaches us how to rhyme, and I demonstrate how to balance a cutting board on top of all the junk piled on the counter? This is one of my absolute favorite dishes when I go out for Indian. Thank you so much for this healthy homemade version! Thank vgourmet.ca! If you like this recipe you probably will like others of hers–they’re all mouthwatering and many are GF friendly! I’ve never made anything Indian yet. This looks like something I may try! My kitchen superpower: I make awesome cheese omelets despite the fact that I don’t like them. Lovely! Nice superpower :D. I don’t really know what mine is… maybe I’m one big super power? Hah. Hm…Indian…You know my deal- trying to get my (young) kids to eat more variety. However, I’m still scarred from when we took them out for Indian food last year. The amount of money we paid for them to have one bite of chicken and a mango lassi…well, obviously we haven’t gone back. So much food-touching-food involved! You must know how that can be for a 4 year old :) All that being said, I think it’s time I give it a try. It’s one of my favorite cuisines and unfortunately, it’s always saved for date night. Drool. I love Indian food Emmy! And you definitely have kitchen superpowers! That aloo gobi looks perfect! You are lucky! I have a complete inability to cook while it’s messy… (in fact my kitchen superpower is probably my ability to wash almost all the dishes WHILE cooking– a little OCD habit of mine– so that the finished product is a delicious dinner AND a perfectly clean kitchen!). This is why I have trouble preparing more than one main dish at a time. That’s funny, I made this yesterday! And it’s sooo good!! This looks really delicious, Emmy. Though I admit I look forward to the bloopers reel. I’ve been on an Indian food kick lately, so this dish is right up my alley! I made a similar one with sweet potato instead of white, which contrasted nicely with the cauliflower. I’ve been getting my Indian inspiration from Bal Arenson’s Everyday Indian, and now I’m getting inspired by you! A sweet potato sounds good! I don’t know that book but I am going to look for it. Thanks for the recommendation! Oh yeah baby! That’s the stuff right there! Good job Em.